If a Regular Chip has a crispy smash and a Ridged Chip is a meaty feast, these Kettle Chips were supremely crunchy by comparison. They were firm and robust and made a loud crack when chomped into. These Chips were more thickly cut than Regular Chips and had a generally raggedy look. There were bends, folds and curls. The Chips looked oil soaked but the texture was rough and ready. There was the odd bit of potato skin on an edge here and there. The color was a sort of golden yellow orange. 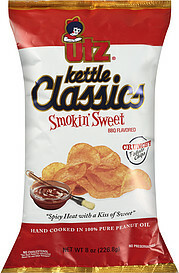 These Chips seemed extra greasy, but that merely helped the flavor ooze out. The peanut oil that they were fried in did not appear to involve itself too heavily in the action. They tasted like spicy Barbecue seasoning dipped in honey. A very sticky sweet honey at that. Surprisingly, the plain, regular, but familiar Barbecue aspect also had a mild and rewarding heat. These were an outstanding example of the flavor.